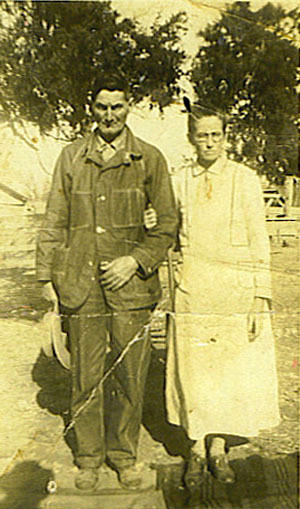 G. B. Culpepper married Fannie Ratliff, Jefferson Co., AR, Book L, page 629. E-mail written 24 Apr 2012 to Warren Culpepper from Jennifer Bryant for Mike LNU (ggs/o #63334), e-mail address. 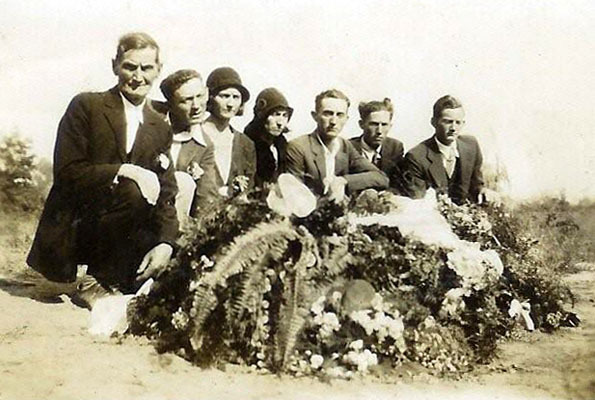 Roxana Elmire "Roxie" Ward, born 1 Jun 1878 in Arkansas; died 9 Jan 1929 in Houston, Harris Co., Texas; buried in Hollywood Cemetery, Houston, Harris Co., Texas, Plot: Section E, Lot 35; Find A Grave Memorial# 57449936. 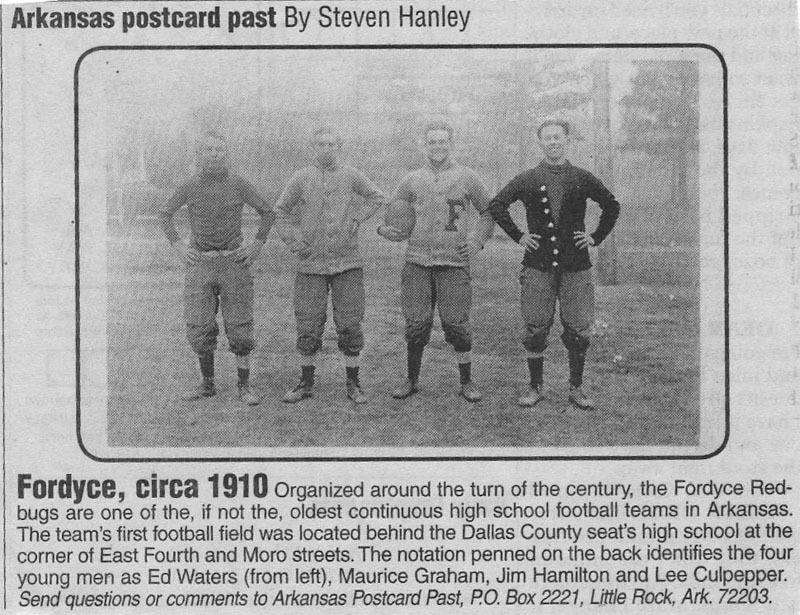 Spring, Jefferson, Arkansas; Roll: 63; Page: 5A; Enumeration District: 89; FHL microfilm: 1240063. Roxie A Ward, Wife, Wh, F, Jun 1878, 21, md 0 yrs, AR/MS/NC. Eunice Olivia Ward Rowell, born 2 May 1903 in Arkansas; died 8 Nov 1976 in Houston, Harris Co., Texas; buried in Hollywood Cemetery, Houston, Harris Co., Texas, Plot: Section E, Lot 35; Find A Grave Memorial# 57449936. Ruby Culpepper, Dau, F, 16, S, TX TX TX. Naomi Culpepper, Dau, F, 13, S, TX AR AR. E-mail written 4 Nov 2011 to Warren L. Culpepper from Teresa Keel (d/o #38100), e-mail address. When he was a child, Leland was given the nickname of Booze by his grandfather who was a minister. 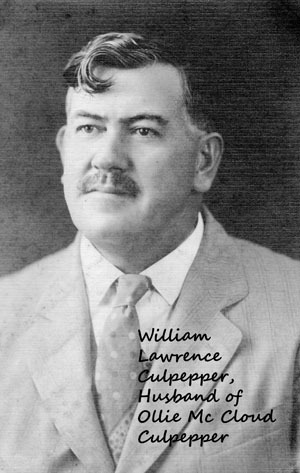 Lealand Culpeper, Son, M, 34, S, AR/AR/AR, Clerk, Meat Market, Vet=WW. ED 127, sheet 9, line 89. Book 16, p. 584, also in 1947, Book 17, p. 31.
has Faulkner Co., AR as place of death. James Lee Culpepper Jr., 21 Jun 1898 - 1 Apr 1956, Served 15 May 1918 to 30 Sep 1921 as QUARTERMASTER 2D in the US Navy, Interred 4 Apr 1956 in Golden Gate National Cemetery, Section V, Site 371. 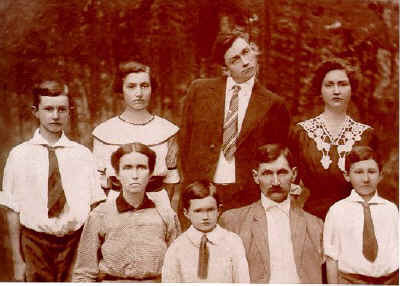 Photographed* circa 1915� He was photographed circa 1915 at Fordyce, Dallas Co., Arkansas. James Lee Culpeper, Son, M, 2, CA/AR/AR. E-mail written 2003 to Lew Griffin from Catherine Culpepper Crottogini, e-mail address. Mrs. M. G. Culpepper, Pioneer Citizen, Dead -- Mrs. Mattie G. Culpepper, aged 81 years, died at the home of her daughter, Mrs. M. C. Andrews in Pine Bluff, Friday morning. She had made her home in Pine Bluff for some time prior to her death. The remains were brought here after a funeral service in Pine Bluff for burial in Greenwood Cemetery Saturday afternoon. The services were conducted by the Rev. John Harris of Thornton. Mrs. Culpepper was a native of North Carolina, but had made her home in Cleveland and Jefferson Counties for more than 70 years. She had many friends in and near Rison. She was a member of the Primitive Baptist Church. Vaughn Culpepper, Son, M, 6, S, AR/AR/KY. Winfred D. Culpepper, Cert 73431, Pinellas Co., FL, White, 07 Aug 1918 - 26 Oct 1973. + Winifred D. Culpepper, 1918 - 1973. Oralle V. Culpepper, Cert 121859, Pinellas Co., FL, White, 09 Oct 1923 - 04 Nov 1992. ED 20, sheet 9, line 84. 1942, Binder 2, Vol. 060, Cert. 4020. Dillie B. Culpepper, Wife, F, 62, M, md@22, IN/OH/IN, Not employed. 1924 - 1933, Pulaski Co. AR, 26 Oct 1933. Mildred Culpepper, Dau, 3, AR/AR/AR. ED 29, sheet 5, line 34. Frank M. Culpepper, Step-son, M, 24, Sng, AR/AR/AR, RR Yard Clerk. E-mail written 1999 to Lew Griffin from Dan Mack Culpepper, e-mail address. E-mail written 2005-2007 to Warren L. Culpepper from Samie Dwight 'Sam' Culpepper (#51943), Macon, Georgia, e-mail address. Lavern Culpepper, Dau, F, 7, AR/AR/AR. J. M. Culpepper Jr., Son, M, 2, AR/AR/AR. Dan Culpepper, 13 Sep 1935 - 17 Sep 2003, Served 2 May 1955 to 31 May 1975 as Specialist First Class in the US Army, Interred 22 Sep 2003, Section B, Site 29. Obituary of Robert Earl Culpepper, published 29 Jun 2005. Book QQ, p. 330, and Book UU, p. 39. Culpepper, age 47 years, 3 months and 19 days. that dark river from whence no traveler ever returns. Cleveland County Herald, Rison, 17 Nov 1898, p. 3, col. 3, age 47. E-mail written Apr 2016 to Lew Griffin from Dale Carey, e-mail address. In case you didn't know, Laura Culpepper is buried in the Hayes cemetery in Norphlet, Arkansas which is where she died. Her head stone is broken and most of the information is missing. The parts that are still there are "Laura A." and "wife of" and the dates of her birth and death. Those dates exactly match the dates on her obituary. In 1898 the community probably had about a hundred people. In 2010 there were 844 people here. I'm curious about why a widow would have been in this tiny place in 1898. There was a sawmill here. One of her sons could have been working in the sawmill. Her father could have been the preacher at the Methodist church. It's an interesting mystery. I'm not related to your family. My mother's maiden name was Hayes. It's our family cemetery. Earl Culpepper, Son, M, 19, S, AR/AR/AR, Farm laborer. ED 84, sheet 26, line 226. E-mail written 1999 to Lew Griffin from Barbara Ellen Toner O'Neal (Mrs. William Kenneth O'Neal -- daughter of Helen Fay Jones and Roy Franklin Toner and granddaughter of Allie Ethel Culpepper Jones), Fountain Hills, AZ, e-mail address. ED 105, sheet 3, line 51. E-mail written Oct 2007 to Lew Griffin from Sandra Fay Toner Mendez, e-mail address.